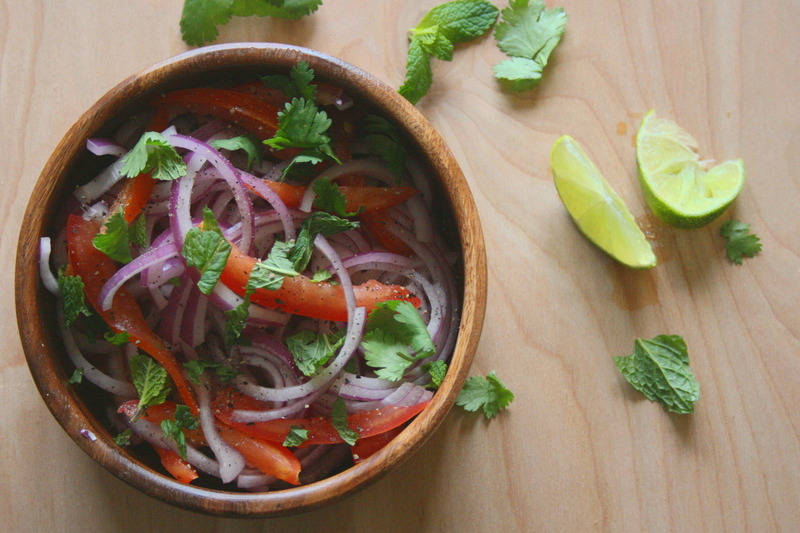 I thought twice when I decided to post Onion-Tomato salad, because there is no ‘recipe’ involved. It is nothing fanciful. And may not be ‘socially acceptable’…with all that onion, yikes! But it makes a frequent appearance on my table despite all the flaws. It would only be injustice if I don’t share it with you. I am not exaggerating when I say that you would find practically no street food stall in India without this. Onions in this are not as vengeful. Lemon juice tames them. They just have enough pungency that I find very appealing with spicy food. If so much onion sounds overwhelming, it can be substituted fully or partially with sliced Cucumber. I prefer Red Onions for the color, but any onions will do. Cilantro and Mint are optional. I can’t live without them. 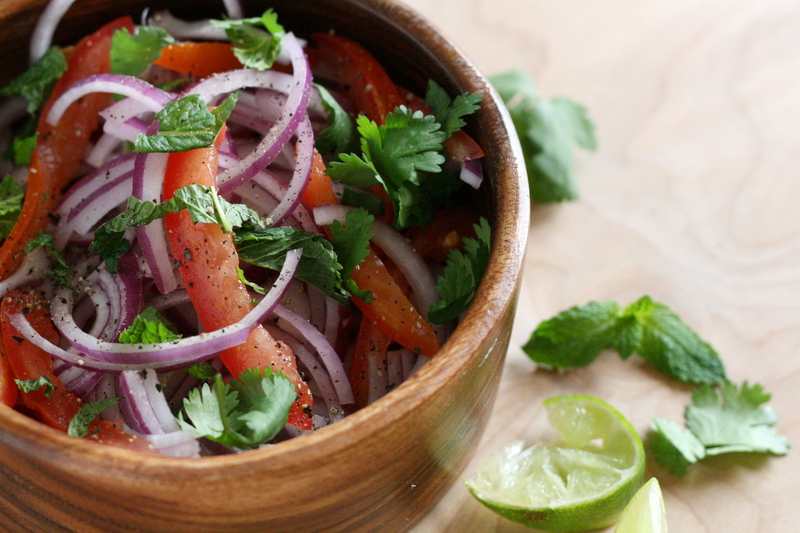 Toss the Onions and Tomatoes in a big bowl with squeeze of Lemon or Lime. Sprinkle Salt and coarsely ground Black Pepper and toss again. Can be eaten right away as a side or topping, or can sit for some time. If left out for too long, it becomes soggy as Onions release water in the presence of salt. This is a great one!! Thanks for sharing with us! I usually try to fool myself into thinking that the mint will counter balance bad breath but really it’s so good I don’t care!! We have this sort of thing all the time, especially when eating a curry. Delicious and fresh!